I find that I'm actually becoming super lazy. I used to sit at my desk with Ableton, Push, Maschine, and so many plugins. After working all day, now all i want to do is lounge in bed and work in on my iPad. I recently bought the NI Symphonic Series and was ready to start diving in and then Matt dropped NS2 on me and suddenly I'm just to lazy to get up and go over there. I either lay in bed, go to the coffee shop, chill on the couch or whatever. I think part of it is that I sit at a desk all day on my computer and do my infrastructure and engineering life that walking over to another desk feels like...I'm at work! Would my desktop setup produce better results? Sure. The components are better as a whole compared to what's available in iOS for the music style that I write. But right now, I don't really care. I like being able to say I did this on my ipad while laying around . I'm not in to music to make money or have bunches of people listen to it. I enjoy sharing with the community of die hards like this. I've been using iOS stuff for awhile but haven't gotten into the Experimental side of things like perplexon and some others that live in AUM and kind of generate a wonderland of textures. I'm still in the I'm writing predictable music mode and there really hasn't been a product since NS1 that I've enjoyed. Not to say I haven't used others, but there's always something that makes me want to stop using my iPad. NS2 has completely changed that. So is this phenomena happening to others? I regularly put a piece of foam on top of my Analog Keys so that it's easier to use my iPad and NS. Its ok, brother. Let it all out. You're in a safe place. Yes, I am weeping for all that investment gathering dust in my synth corner. Damn you, easy-to-use NS2! Enjoy it ! It's great ! Yep. I’ve been ignoring a pile of hardware synths for years. Got into NS1 in Aug/July 2010 and now of course NS2. Today I have a pile of apps on my iPad/iPhone that I am ignoring. That’s the NanoStudio Effect. I have some hardware sitting in the closet worth a couple of grand. Will try to sell when tax refunds come out and people have $$. Wish I could sell all those apps I’ll never use again!
. Will try to sell when tax refunds come out and people have $$. I'm still first in line for the Oberheim, right? 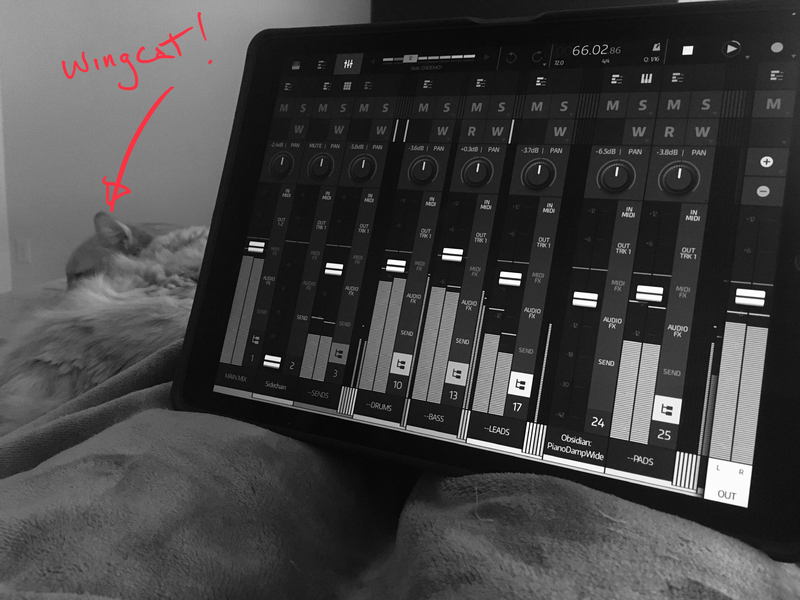 Not wanting to sit at a desk with a computer is precisely the reason I prefer making music on the iPad - I have zero interest in desktop music software, because I sit at the damn computer all day for work, in the evening I want to get away from that thing. Also, the touch screen is just awesome as a musical controller in itself. However I've felt this way long before the advent of NS2. I really like NS2 but I also have just as much fun making music in GarageBand, Cubasis, Auria or Gadget. I'm DAW agnostic and enjoy using all of them for different reasons. I tend to mix my NS2 compositions in Auria anyway, but that may change when audio tracks come, especially if more the of the FabFilter plugins are released as AUv3. especially if more the of the FabFilter plugins are released as AUv3. oooh this !!! I want Saturn AUv3 sooo much.. best ovedrive/distortion ever made on all platforms. period. Pro L2 has the best metering I've ever seen anywhere. I like Saturn a lot, but there are some pretty decent alternatives around now as AU, for example Klevgrand ReAmp is almost as good IMO, especially for more subtle warming. And Degrader is great for more destructive effects. Saturn obviously can do oversampling, which gives it an edge. But yes, having the full suite of FabFilter plugins is one factor keeping me in Auria for mixing. NS2 is the only other DAW that comes close in terms of flexible routing etc... With the slow development of Auria it's possible that NS2 could overtake it one day, interesting times. The only thing that keeps me in bed all day with an iPad and NS2 is the fact that only my wife has an iPad that can run it. My iPad is an iPad3. Too old. So I’m limited in my time with NS2. When the iPhone version comes out, I may not survive. Oh yah, desk = work and I feel I am sputtering to a stop with it very soon. Audio tracks/freezing and AUfx automation should really speed it along. Your thread has been burning a hole in my psyche the past couple days. Bed ridden again this evening. I’ve been working on this same tune for weeks. But the good news is I think it’s finally structurally complete! Also good news, normally I would have given up on this one forever ago, but I kept experimenting with different things in the app and it kept me pushing forward. Next will be automation and some transitional elements. NS2 still has my full attention. This lovely and cozy navigation means I am more likely to dip in and out of this and that and tweak/polish even the tiniest details. I am coming up with some of my best mixes here on NS2. Automating and grooming levels, filters etc is a treat rather than a chore. My motivation to export to desktop for ‘finishing’ is at an all time low now. Edit - deleted, wrong thread. Semi-Pro tip: instead of automating the volume fader, automate the GAIN control from one of the built in effects. That way you can still use the volume fader for adjustments. I always forget to do this, yes great tip! Couldn’t I also automate the fader and tweak the gain control on the built in effect as well and get the same result? Of course but the you gotta dig into the effects screen for each volume tweak. If you automate the volume just group your track into an empty track above it and then use the group fader for overall adjustments. that's the way I've always done it anyway. If I did that way, right now I’d have 140 tracks. Scrollpocolypse.